What kind of bike? Have a pic? Works on kickstart mechanism, and holds exhaust valves open a tiny bit too allow for easier kicking. So the decomp cable goes to the head, not the clutch as stated by OP? Sofiedog is right. Got nothing to do with the clutch. Don't be kicking your motor over wearing flip flops if the decompression cable is disconnected. What's an OP? I've never had a bike with a cable actuated decompression feature. So, one cable comes from the handle bar. What's the other cable for that goes behind kick starter? Maybe, that's what OP (original post) was talking about when he said it was a cable that went to clutch? I had the same bike for almost two years and I took the handlebar mounted decomp cable off when I got it. You don't need it on an XR350R. The PO used it as a kill switch, after I put a proper kill switch on it I needed room from my tusk lighting kit controls. You are not damaging anything. And mine never had a kick start decomp cable. Although I wonder if I had left the decomp on, would it have been easier to start when hot? The cable on the kickstarter tells the compression release on the head to get to work. 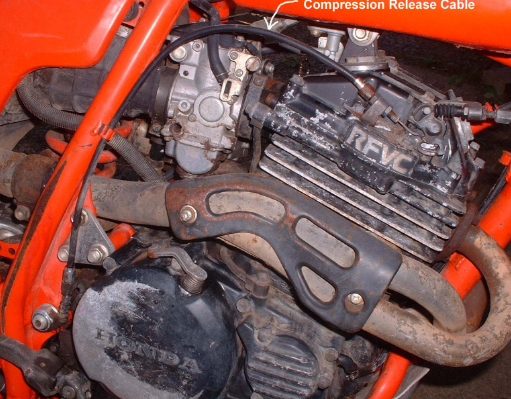 With my 1982 XR500R I would not be able to start it without the decompression cable. Mine works two ways. Automatically with the kickstarter cable attachment the compression release and also a manual cable attached to a lever on the handle bars. I removed the kickstart cable and just use the manual lever.